In OECD countries, suicide rates are higher among young men aged 15 to 24 years than among young women. Japan has the highest suicide rate for both genders at 20.4/100,000 for young men and 9.8/100,000 for young women. 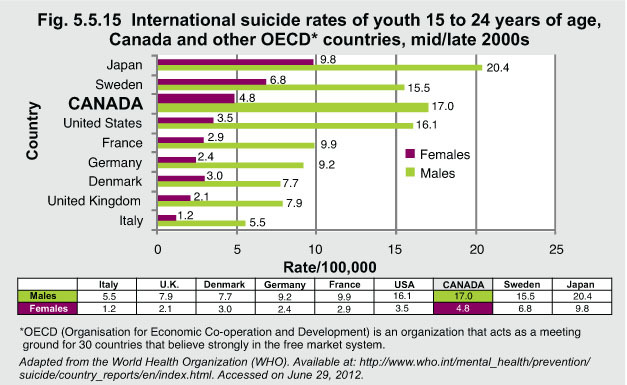 Compared to the other OECD countries, Canada has the second highest suicide rate among young men (17/100,000) and the third highest among young women (4.8/100,000). 1Oliver LN, Peters PA, Kohen DE. (2012). “Mortality Rates Among Children and Teenagers Living in Inuit Nunangat, 1994 to 2008.” Available at: http://www.statcan.gc.ca/pub/82-003-x/2012003/article/11695-eng.pdf. Accessed on June 29, 2012.